‘Making Time’ is Jamie Woon’s second album and comes over 4 years after his debut ‘Mirrorwriting’, which was released back in 2011 to mixed reviews. So far just one single has been released from the new album, the catchy ‘Sharpness’ (Mary’s previous In the Post feature on the song here), which embodies the less is more spirit that echoes throughout the rest of the album. The singer/songwriter from London has managed to produce something difficult to place: one minute were hearing the scratchy drawl of Willy Mason on a brass-accented acoustic track, the next you’re bopping along to some smooth soul vibes and echoes of old-school r&b. It’s mellower than his previous stuff: you won’t hear much of the electronica influence that is present on earlier songs ‘Night Air’, ‘Lady Luck’, or ‘Shoulda’. Perhaps some fans will find this disappointing, but this still feels like a step forwards: holding on to the trip hop/soul infusion of previous stuff but bringing something different and fresh to the table. That’s why this album has the air of evolution about it, drawing on much of what was great about Woon’s earlier work but smoothing out the edges a little bit. There are certain adjectives that you can’t help but use when describing the album: soulful, smooth, mellow, chilled. It’s easy listening. But, that’s not to be confused with unexciting or dull. The opening track ‘Message’, for example, is stirring, the gentle build of the song’s opening with Woon’s vocals effortlessly fusing into the song alongside the minimalistic piano notes. ‘Skin’ also has a mesmerising opening to the track. The use of autotune brings a surprising depth to the song, paired well with the soulful oohs that reverberate throughout, like a lullaby. Woon’s strong yet sultry vocals are predominate and hold centre stage throughout the album, complemented by the soulful undertones. The instruments are controlled and often times subtle, used to complement Woon’s voice rather than mask it. The lyrics really are quite lovely. From the opening lines of ‘Skin’ (“skin with its open agenda / rise to the top for some air”) to “light into darkness / cut on the sharpness of you” on ‘Sharpness’ (Woon’s most played song on Spotify), the lyrics have a physical feel to them, evoking nature and human connection. It’s easy to hear echoes of Frank Ocean throughout Jamie Woon’s album, in particular the opening track ‘Message’, with Woon’s smooth voice lapping alongside the soulful music like murmuring waves. The whole album, at various times, is wonderfully reminiscent of ’90s r&b, I’m particularly thinking of R Kelly’s warbling vocals and the stripped back use of instruments in much of his music. Woon’s vocal ability lends well to the tracks. Some songs, such as ‘Celebration’ and ‘Sharpness’, are standouts. ‘Celebration’ is distinctly different to the rest of the album: it was a nice surprise to hear Willy Mason’s gravely tones on this track, paired with the bursts of brass, the jangly acoustic notes and the soft tempo of the drums marching along. On the previously mentioned ‘Sharpness’, at times throughout the song it’s easy to hear Daft Punk, Frank Ocean and Jamiroquai, and perhaps that’s why I like it so much. It sounds so familiar, while still being different, and won me round straight away. Admittedly, a couple of songs, like ‘Lament’ and ‘Forgiven’ are pleasant enough to hear, but don’t really leave a distinct impression. But, as an overall collection, it really does work. It’s well crafted. This is an archetypal chill-out album, great for a lazy afternoon at home or to be left purring away in the background at work. The lyrics are beautiful, the melodies soulful and classic. On a couple of the tracks there’s a little something left to be desired, but, having said that, I love it, and have been playing my favourite songs non-stop. If it didn’t get me there on the first listen, but it really did on the second. Jamie Woon’s ‘Making Time’ is out now on PMR Records; Woon will be on tour in the UK in March 2016. For all past coverage on Jamie Woon on TGTF, head here. Soulful singer/songwriter Jamie Woon has announced a short run of UK live dates to follow the release of his long-awaited sophomore album ‘Making Time’, which is out now on PMR Records. Editor Mary had a listen to the album’s lead single ‘Sharpness’ back in August; you can read her thoughts on the track right here. Below the tour date listing is a live video of ‘Sharpness’ recorded at Konk Studios. Tickets for the following shows are available now. 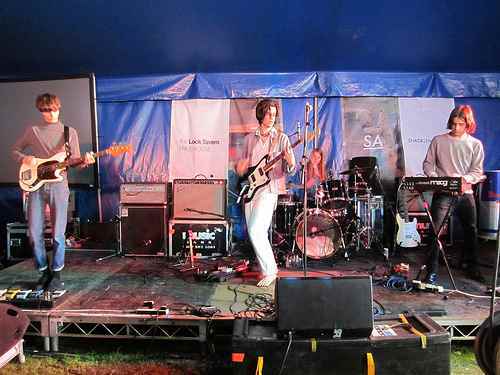 TGTF’s previous coverage of Jamie Woon, dating all the way back to 2011, can be found here. Jamie Woon is back with a beard. But more importantly, he’s brought along with him the first taster of his upcoming album out later this year on PMR Records, the follow-up to his well-received debut ‘Mirrorwriting’ in 2011. I’m sure fans who have been waiting for something more than his brief stop-gap appearing as guest vocalist on ‘January’ appearing on Disclosure’s 2013 Mercury Prize-nominated album ‘Settle’ are very excited. And from the word go, the coolness of his previous standout ‘Night Air’ is immediately evident on this track ‘Sharpness’, which is a great start. But that’s really where the similarities between the two songs end. It’s almost if the percussion and hand claps are fighting with Woon’s voice in an effort to make the track more radio-friendly, and I reckon this was a massive mistake. The beauty of ‘Night Air’ was that it gave his voice room to breathe, and on ‘Sharpness’, because the instrumentation has been made too in your face, you can’t concentrate on anything else. If Woon is going to separate himself from the rest of the Radio 1 pack, he needs to stand out, and the style of this song minimises his singing talent that made him so special. It’s lyrically where ‘Sharpness’ has its saving grace. Woon sings in the chorus, “every day is the day that you saved me / light into darkness cut on the sharpness of you”, which by itself deceives you on what the song is about. Loneliness. His lover has left him (perhaps it’s a friends with benefits situation?) and he’s contemplating who he was when he was with her; he existed and gave into something bigger than he was that was amazing, and he’s wondering what he’s done wrong (“is it written on my back?”), yet he seems desperate to have her back (or to get that feeling back) at any cost, even if she has to leave again (“take it back and then let it go”). There are deep emotions on display here, and it’s a shame that the instrumentation couldn’t take a backseat to let Woon fully explore this. ‘Sharpness’, the new track from Jamie Woon, is slated to appear on his second album, expected later this year on PMR Records. Coming the day right after Underage Festival, Field Day is a similar festival, but for adults. I experienced far too many clashes at Field Day; as a result, I missed nearly 70% of the acts that I intended to see. Funnily enough, I also bumped into some sets by bands I’ve never heard of before. The first act I saw were S.C.U.M. I really dig what I’ve heard from them so far, and so I was anticipating their performance. Since they were playing one of the earliest slots, I had time to stay around while they were setting up. The whole performance was really good, and they’ve attracted a whole full tent of audience, even being one of the earliest acts to go on stage. That’s how good they were. I believe they played some songs from their forthcoming debut album ‘Again Into Eyes’, and I do like the sound of them. After seeing S.C.U.M, I met up with my friends and had some food, getting ready for the busy afternoon/ night that followed. It started raining at about midday, and everyone was really worried. Turns out it was only a shower; no big deal, eh? My friends and I then went to the Village Mentality stage, wanting to see Ariel Pink’s Haunted Graffiti. Unfortunately, by the time we arrived, the stage was already too packed (actually rammed) to be able to see anything. We stayed for a while and left cause we could barely hear anything from where we were stood. It was that packed. We then moved to the Lock Tavern stage. Spector were playing, and I didn’t know them at all. All I saw were a few men in suits playing some music with a retro touch. A little bonus was that they kept telling jokes between songs. Some of them were quite awkward, but I appreciated the effort as it made the atmosphere in the tent really good. People kept cheering and despite I didn’t know the band, I still had fun. Later on, I saw About Group (pictured at the top of this post) at the same stage, but bit later. I arrived late and only caught the last few songs. It was more like an Alexis Taylor DJ set than an About Group set as I imagined. Although it wasn’t really like what I expected, the remaining set was still fun. It was chilled and everyone seemed to have a good time, great! I wandered a bit and bumped into Electrelane’s performance. I have never heard of them prior to the performance, so it was fresh. I was attracted by their electronic sound and I quite liked it. Out of curiosity, I went to a stage where I saw people dancing like crazy. After having checked my timetable, I confirmed it was Benga and Youngman playing. Something really funny happened: Benga and Youngman asked the audience to “get up”, and then all the ladies went on their male friends’ shoulders. 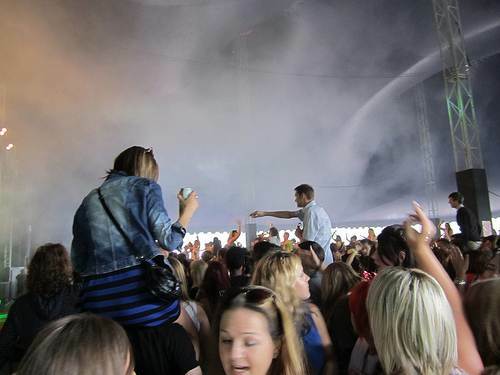 That caused the security to panic, and the security signalled people to get off from their friends’ shoulders, because they were worried someone would get hurt. Of course, the crowd didn’t listen. So guess what happened next? Benga and Youngman actually asked the crowd to “get down”; miraculously, the crowd followed. I found that kind of funny, but probably the security wouldn’t agree with me. I kept wandering around, yes, I did. Then somehow I met up with my friends again at Zola Jesus’ set. With much attention from the media lately, I was pretty curious about their performance. Nika put a lot of effort in her part and I could sense that. But to be fair, I am not really a fan of their music. As a result, I didn’t stay there for long and went to the Laneway Festival stage for Jamie Woon instead. I’ve always found Jamie Woon’s style quite similar to James Blake’s. So I suppose it’s fair to say that Jamie Woon prepared the crowd for the upcoming set from James Blake. I found it peculiar that Jamie got a bigger cheer from the crowd when he played ‘Night Air’ than when he played ‘Lady Luck’. I genuinely thought the latter would get a bigger response. The crowd sang along to ‘Lady Luck’, and the song also put dancing boots on everyone’s feet. 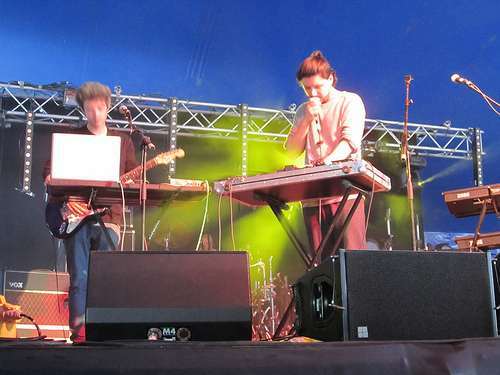 Stay tuned for part 2 of Coco’s experience at Field Day 2011, including coverage of James Blake and Wild Beasts. Here’s Copenhagen producer CHLLNGR‘s interesting take on Jamie Woon‘s ‘Lady Luck’, which we featured a while ago as a Video of the Moment. This is a bit different for a remix: apparently Jamie Woon had a PA issue at a recent show, causing him to do the song a capella, and that’s the piece that CHLLNGR started with. There’s a kind of monstrous thumping in this remix, almost like sinister footsteps, and the whole vibe is all very eerie. Thoughts? Jamie Woon‘s new single released today is called ‘Lady Luck’, and for the promo video to accompany it, he was filmed travelling what we believe to be his commute home, as if a love letter to the urban jungle that is London. Watch it below. What I want to know is, where did that moustache come from? ‘Lady Luck’ by Jamie Woon is available now. Woon’s debut album ‘Mirrorwriting’ comes out next week, on the 18th of April.